The inside consists of three aisles, there are two altars: the left, the Saints Stephen and Bernard, is dated 1478, the right one is dedicated to the Blessed Virgin. 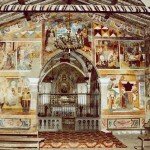 But what sets this Church among the most appreciated buildings of the Lake are the numerous frescos. 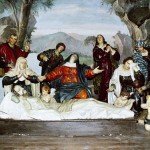 These are works that date back to the late 1400s and the early decades of the 1500s and which are, for the most part, attributed to Giovanni da Marone, Brescia’s artist of the early Renaissance. Outside is remarkable the fresco of St. George on a white horse slaying the dragon, and the gigantic portrait of St. Christopher invoked against the plague. 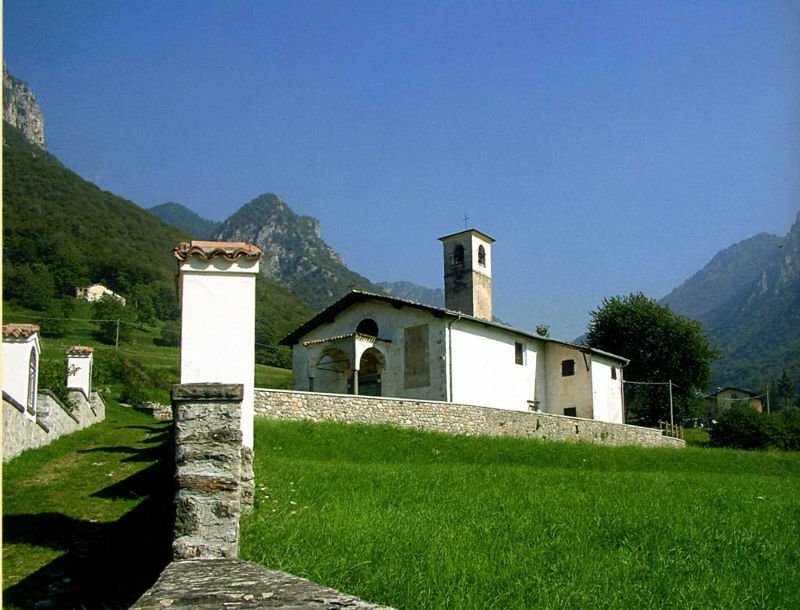 Leaving the church of San Giorgio and heading to Zone, a small country church is found on the right after about five hundred meters, it can be reached through a path flanked by the chapels of the Via Crucis, is the fifteenth-century Church of Saints Ippolito and Cassiano, initially used to host travelers and pilgrims who went to the Valtrompia and the Alto Sebino. In 1400 it was also a school for the children of the growing rural population, but at the end of that century was consecrated to worship. 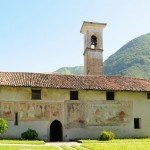 It is rich in frescos, some of Giotto style, contains paintings of Ferramola school and also the statue of the Virgin attributed to Pietro Ramus, and the statues of the patron saints, placed here in '600, the portal in Sarnico stone, the facade very similar to that of San Pietro’s hermitage in Marone, while the interior has a nave, contains frescos and wooden statues of Saints Ippolito and Cassiano. 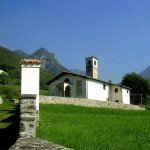 In Zone, near Piazza Giuseppe Almici, we find the eighteenth-century octagonal chapel dedicated to Our Lady of Lourdes; always in Piazza Almici the Parish of St. John the Baptist appears in the local historiography from the sixteenth century, when substituted the medieval church of St. George in Cislano as parish. 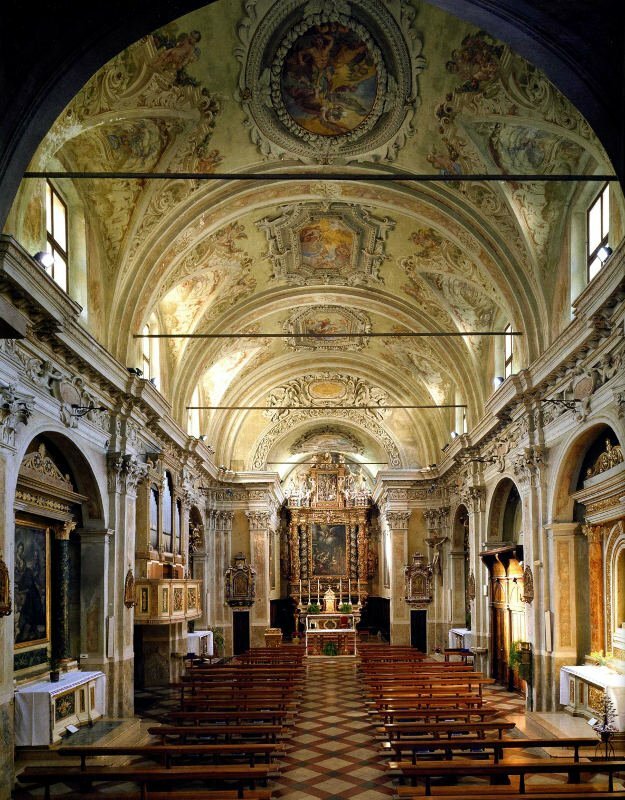 The earlier parish building in Cislano, completed in the eighties of the '500, it soon became not sufficient, therefore Monsignor Giustiniani, Bishop of Brescia, to decree in 1637 a new extension. 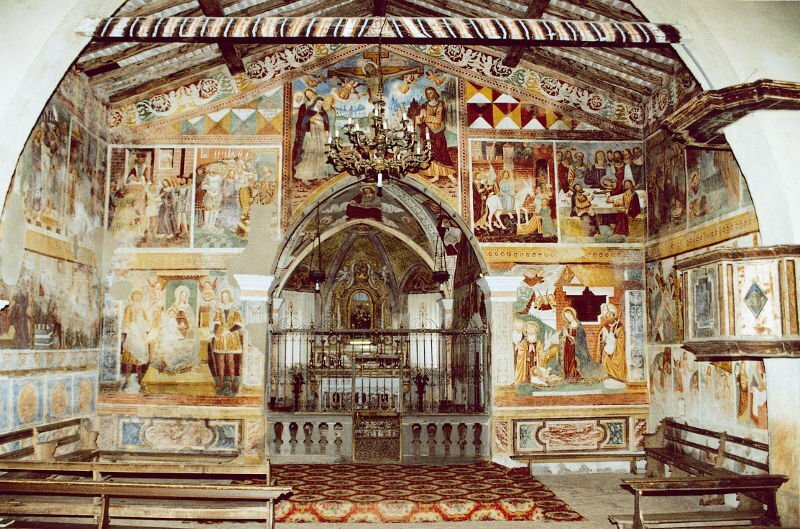 Although, as pointed the historian Don Alexander Sina (1941), the limited documentary notes does not made possible to accurately reconstruct the various phases of the architectural construction, the elegant decorations are still visible inside the church show how carefully the ancient pastors cared about the work. Among these, a special mention goes to the camuno Don Barolomeol Belotti (1674-1714), to whom we owe the most important commissions for the preparation of the three main altars of the temple, so they were put in charge, among others, the sculptors Fantoni of Rovetta and the painter from Brescia Francesco Paglia. The rectors post Belotti were committed throughout the '700 and beyond to the completion of the choir, adorned with a marble altar finely worked, and the roof by the painter Domenico Voltolini from Iseo (1666-1746), author also of the frescos, now quite ruined, the octagonal chapel adjacent to the church (the early '900 Marian Shrine). Inside you can see the wonderful sculpture of “the Lamentation"(1690-1691) consists of ten statues and four cherubs in painted wood, last work by Andrea Fantoni (1659-1734) for the church of Zone; the “main altar”, which is one of the most magnificent and complex endeavor by the carvers of Rovetta, was created by Andrea Fantoni between 1685 and 89. 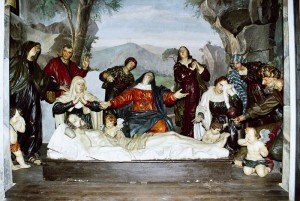 At the center of the wooden frame you can admire the "Nativity of John the Baptist" by Francesco Paglia. 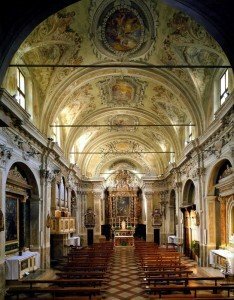 - The church of Our Lady of Disgiöl, eighteenth century, was built on a cliff near the center of valley dell'Urbes, along a well-preserved stretch of the Via Valeriana. At the origin of its construction there is an "ex-gratia" for the narrow escape from a landslide, which legend has it blocked by the hand of the Virgin Mary. 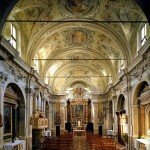 - The church of S. Antonio Abate, located in the hamlet of Cusato, was originally the chapel of the Friars Antoniti; a pillar inside shows the year of the consecration, 1581. 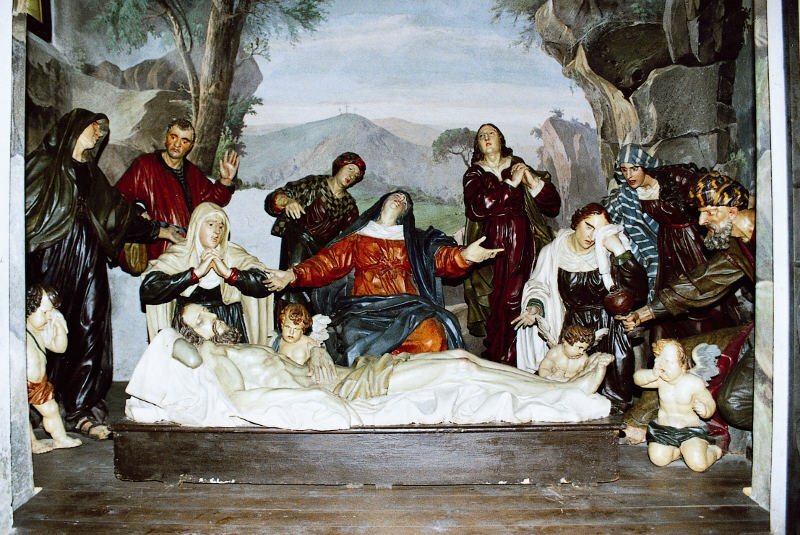 Some frescos inside were commissioned to Voltolini from Iseo, he lived in the eighteenth century.